Sometimes - you just have to know. Do you want to know where your car has been? You've got your reasons I am sure. Maybe you want to snoop on your husband/wife/mate/girlfriend/boyfriend. (Note: It is illegal to use this on another person's vehicle without their permission) Maybe you are just the nosy type, or maybe you have some other reasonable need to know. One thing you can do is hire a Private Investigator. But if you are Daddy Warbucks (or his gold-digger) go ahead and pay $500 bucks or more a day! I am all for employing detectives. Or... you could play detective yourself (after all, this IS Be Your Own Detective) and "tail" your own car. Heck, at today's gas prices who can afford to do that? 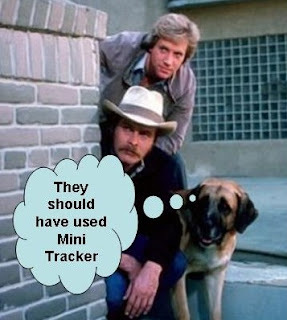 What the Mini Tracker is - a great way to track where your vehicle has been. Hi I just added you to the EntreCard Power Dropping Page. You are listed in Blogs 101-110...My blog entry wasn't clear, I fixed it up and noticed you did not link to The Power Dropping Page, You can do this in a blog entry or anyplace on youir blog. Thanks. Mini tracker is an awesome concept. kinda creepy though. Are there any that allow you to retrieve the information wirelessly? Or maybe even in real-time? gsmith - yep there are real time trackers, they are just a lot more expensive. Just click the spy gear 4u widget in my sidebar and search their site.